Exchange more, learn more, do better. Join our international network of over 2000 professionals. Just press the sign-up button to get started – it’s free! 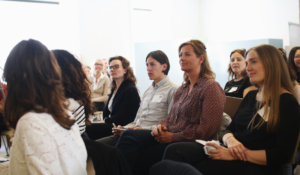 As Denmark's leading company in technology and communications, TDC gives high priority to the following five CSR focus areas: Digital Denmark; Customer trust and safety; Climate and environment; Employee well-being and diversity; and Social partnerships. KFUMs Idrætsforbund contributes significantly in promoting and strengthening children's and young people's joy of play, movement and well-being by creating the basis for leisure time activities. Husbanken has a 60 year old history in housing people, and is one of the main actors in getting everyone in Norway a safe shelter. With a 60 year old history in housing people, the company was initially established as a bank with the intention of aiding the housing supply to get Norway and its people back on its feet after the Second World War. Transportation is one of the main sources of energy-related carbon dioxide emission, and the annual vehicle production has sky-rocketed globally the last years. The Norwegian Railway Service - NSB (Norges Statsbaner) aims to provide sustainable and intelligent mobility solutions for the society. Being one of the leading Norwegian corporations within property, hotel and restaurant industries, the Olav Thon Group strives in particular to focus on its environmental efficiency, with careful management of energy and waste of core concerns. 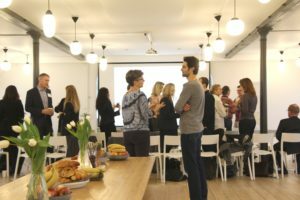 With initiatives ranging from eco-aware shopping centres and green conferences to sustainable offices and carbon-neutral hotels, the Olav Thon Group has shown that corporate social responsibility is a significant part of its business agenda. 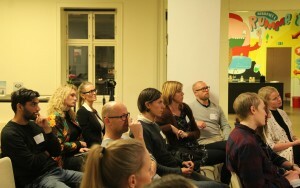 The Norwegian social enterprise Medarbeiderne (the Co-workers) has established a non-profit business out of employing recovering drug users to gather recyclable cans and bottles from private households and companies, and continue to follow the vision that "all people shall have the opportunity for a dignified life through work and self-realization". Every day 39,000 underaged girls are forced into marriage - some as young as 8 years old, giving up their childhood and control over their own lives. 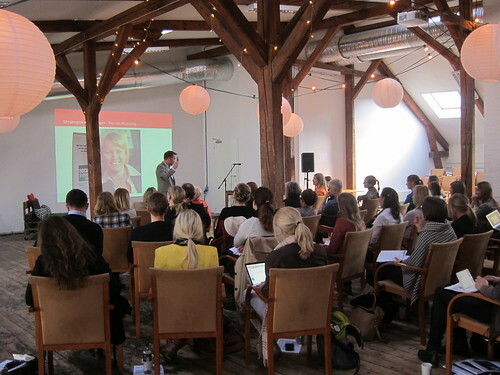 Plan Norway´s prize-winning campaign "Stopp Brylluppet" (Stop the Wedding) reached a billion people - inspiring and engaging people from all over the world to speak up against child marriages. The South-Eastern Norway Regional Health Authority has created a standard for environmental management in all of the regions hospitals. The primary task is to be a driving force for sustainable procurements e.g. life cycle costs and an ethical supply chain, taking the environmental impact of its manufacture and disposal into account. The organization has won several prizes for its efforts to promote ethical trade and purchases. Watch pictures, read about the themes, and learn more about the guest speakers, who have contributed to previous miniconference events. You’re a passionate professional in the business of doing good & doing well. But what about your own sustainability? How can you keep yourself in balance in a fast-paced environment? How are you connecting to your own purpose? And what can we do to create a workplace culture that embraces consciousness, authenticity and meaning? The award-winning sustainability expert and Young Global Leader, who has discovered how silence and Nature can lead us to a sustainable world (Laura Storm, Founder, Regenerators). 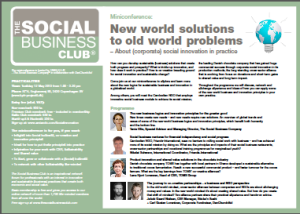 If you were unable to attend, you can read articles highlighting the different approaches adopted by our speakers by clicking on the text marked in green above. 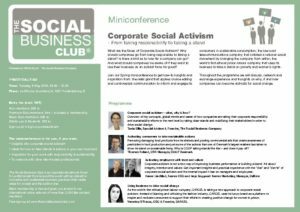 Call Me: Is corporate activism just a sales booster & brand builder? 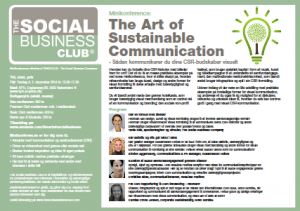 Fairtade Mærket Danmark: How can virtual reality inspire and engage sustainable consumption? 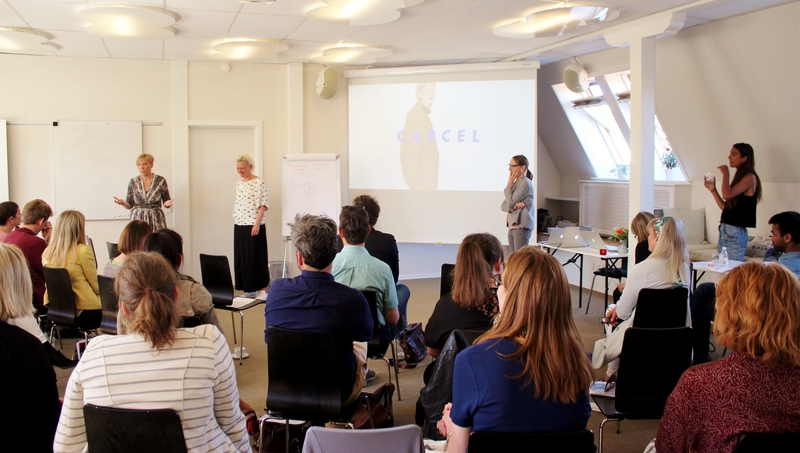 De Forenede Dampvaskerier: How do you boost sales with sustainability? KRUKOW: How can you nudge your way to sustainable consumption? PKA: Etiske investeringer – dialog eller sortlisting? Danske Spil: Ansvarlighed i spilbranchen – god eller uetisk forretning? The Cambodian NGO that employs innovative social business models to achieve its social mission (-Nikolai Schwarz, International Coordinator, Friends-International). 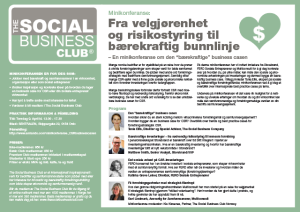 The leading Danish chocolate company that has gained huge commercial success through corporate social innovation in its production methods (Lene Hjort Lorenzen, Head of CSR, TOMS Group). 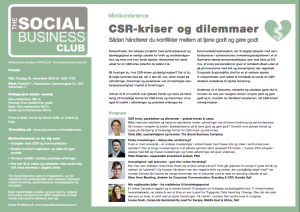 The long-standing cross-sector alliance that is evolving from focus on donations and short-term gains to shared value and long-term impact (Jakob Gaard Nielsen, CSR Manager, Sticks’n Sushi + Carl Gustav Lorentzen, Corporate Fundraiser, DanChurchAid. 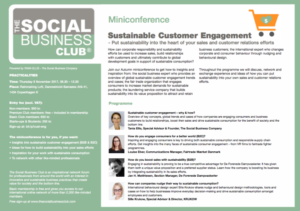 Social business expert Tania Ellis introduced the miniconference with an overview of global trends and cases of shared value partnerships. 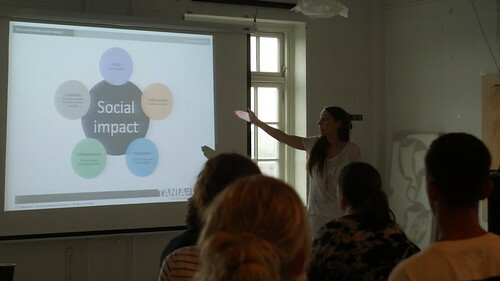 We also heard Tania Ellis speak about business strategies and trends focused on social and environmental sustainability. In this article you can read more about the 7 Growth Strategies for susccessful sustainable businesses identified by Tania Ellis in her book The New Pioneers. 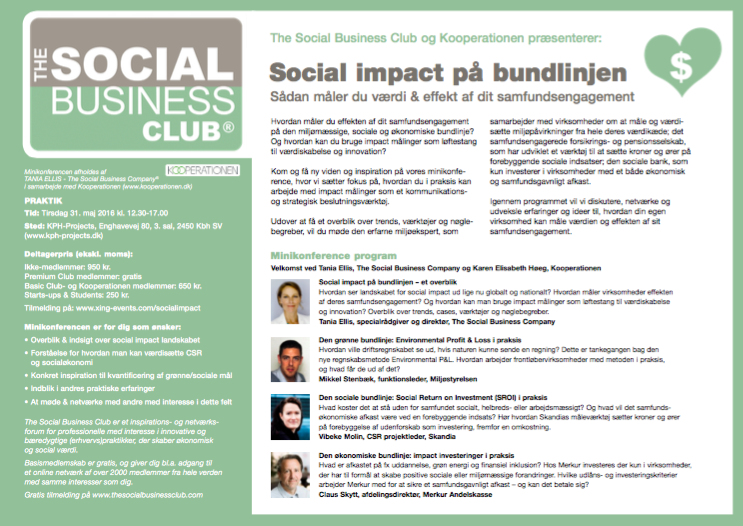 – About socially responsible and innovative business opportunities through social media. 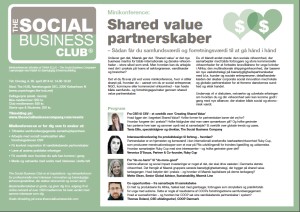 – About opportunities, challenges and paradoxes of creating economic and social value.